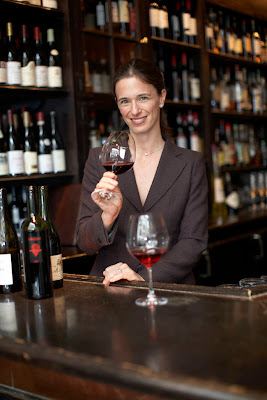 The amazing Juliette Pope of Gramercy Tavern is on I'll Drink to That! today. Juliette is the Wine Director at Gramercy and has been for several years, but she also has a long history there working through the ranks, beginning as a line cook under opening chef Tom Colicchio. You can hear her talk in the interview about what happened to take her from the hot line and bring her to where she is today. Along the way you can hear about the genesis of one of the best wine programs in the country. Juliette rarely grants interviews, and this is a particularly good one. You can hear it all on iTunes or on Stitcher. The Treasure House Gate, the Hozomon, is the inner gate of the Senso-ji temple in the Asakusa district of Tokyo. It's second floor houses a Lotus Sutra, as well as a collection of Buddhist Scriptures. The ground floor of the gate houses two 18 foot tall Nio guardians, badass protectors of the Buddha. The temple itself is packed with tourists from Japan and elsewhere. Many visitors here submit small monetary donations, and large prayer requests. Of to the side of the temple grounds the mood is serene. A Buddhist temple was first constructed here in 645. Many of the these buildings were destroyed by the fire bombings of World War II, and subsequently reconstructed. There is the sense of a continuity of form, even as individual pieces have been rebuilt. The outer gate is the Kaminarimon, the Thunder Gate. Reconstructed many times, a gate was first built on this site in 941. And down the street from the Kaminarimon is the Kamiya Bar, which has operated since 1880. This was the first western style bar to open in Tokyo. The Kamiya Bar is a working class bar, popular with older male patrons from the area. They bring their cigarettes and light up over glasses of the house Denki Bran, or hoist a large draft Asahi (the office building headquarters of Asahi are just across the river outside). The mood is raucous and rough, but welcoming, as you might expect from a neighborhood bar in South Boston, or maybe a Peter Luger's without the steak. This was one of the first bars in Tokyo to offer communal seating, as opposed to many private rooms, a tradition which it upholds today. You might sit next to anyone here, of any status, and that is how the customers like it. The furnishings are stark and simple. Denki Bran is the specialty of the house. Supposedly a blend containing brandy, gin, wine, vermouth, curacao, and herbs, the taste is something like a lighter Grand Marnier, although maybe a bit rougher around the edges. You can take it neat, as I did, or in one of several different cocktails on offer. "Denki" means electricity, and the Denkikan was a famous movie theater, in fact Japan's first movie theatre, which opened nearby in Asakusa at the turn of the 20th century. There is also an extra aged version of Denki Bran, and another with a different proof. And of course there are other beverages on offer as well. We bypassed the second floor, where western style cuisine is served, and headed to the third, where the menu is composed of Japanese izakaya fare. Which began to arrive as we all sat down. Sake here is filled to the brim and then over it, overflowing onto the plate beneath. This is a sign that you are being well taken care of by your server, and not being short poured. You are supposed to pour this "extra" back into your glass as you drink it down. Of course to drink all that I'd need more food. And luckily there was plenty to be had. There is a lot of tustle and pull and alarm in the Scheherazade of Rimsky-Korsakov, but also a lot of calm. We arrived at the massive torii gate in Nikko, in the Tochigi prefecture. Standing in this spot, you at the same elevation as the topmost tip of the highest tower in Tokyo, the Tokyo Skytree. The tall forest that surrounds the shrine here dates back to the 17th century. The three wise monkeys do not hear, speak, or see any evil. Presumably that means that they don't know what happened to the first monkey's fingers. Or if they do, they won't say. The Sacred Horse of Nikko in the stable. This horse was a gift from the people of New Zealand. A second torii marks the entrance to the Nikko Tosho-gu, the shrine dedicated to the founder of the Tokugawa shogunate. Construction of these buildings began in the Edo Period, in 1617. The elaborate wood carvings deserve a close look. The building that you see at the end of this picture, which unfortunately does not allow pictures inside, is a magnificent echo chamber, with sounds made inside multiplied many times. It is as if distance does not exist for these sounds, at least for a moment. We followed the stone path to the Shogun's tomb. All was quiet here. Perhaps we were silent, or perhaps the cool breeze did not carry the noise. Here was the Shogun's tomb. The remains of Tokugawa Ieyasu rest inside, as they have for over 300 years. This hall, covered in carvings of fantastical animals called kirin, was being renovated. We stayed inside for quiet awhile, but I'm afraid they did not allow photographs here, either. We walked back from the shrine into the mountain town. The bridge is part of another shrine. Where we has a nice lunch. They specialize in a sort of skimmed tofu dish here, which you can see in the top left hand side of the picture. We perused the bakery near this telephone booth. And then we climbed the hill to the historic Kanaya Hotel. Where we found a smaller, more personal shrine in a clearing. Less massive and less elaborate perhaps, but also more private. In Nikko the sacred is contained within many forms.